The North Cork AC athlete produced scores of 32.28 metres and 32.95 metres in Berlin. Ireland's Noelle Lenihan (file pic). IT’S BEEN AN unforgettable day for Ireland’s Noelle Lenihan at the World Para Athletics European Championships in Berlin, as she won gold in the F-38 discus. The Milford native threw two world record scores of 32.28 metres and 32.95 metres on the way to a successful defence of her European title. Czech athlete Eva Datinska and Latvia’s Ingrida Preide took silver and bronze respectively. Lenihan’s feat comes on the back of some similarly impressive achievements from other Irish athletes competing in Germany, with Orla Barry, Jason Smyth and Greta Streimikyte all winning gold on Tuesday. 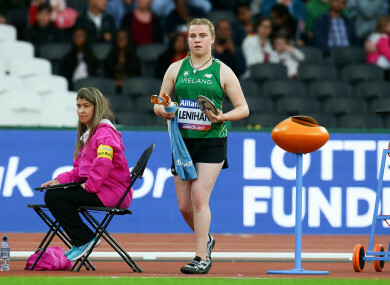 Email “Ireland's Lenihan breaks world record twice on the way to winning gold”. Feedback on “Ireland's Lenihan breaks world record twice on the way to winning gold”.